This is how it all begins... Our first encounter with "the Jew" in The Jew - the title character in Michelangelo Buonarotti the Younger's play. Here's the story line... Alamanno dei Tolosini - father of Oretta, the female love interest - is having trouble raising his daughter's dowry. a rovinare i giovani con gli scrocchi e l’altre rinvolture che tu sai. Alamanno Tolosini: ... Then I have to collect a thousand scudi from Beniamin the Jew for the merchandise that I gave him. The bill is due, but we can expect the usual difficulty in getting Jews to pay up. When it comes to business, these Jews are always out for themselves. And I am not even mentioning those Jews who go out of their way to ruin young people with sharp practice (scrocchi) and frauds (rinvolture) of every kind. What can we do except shrug our shoulders? 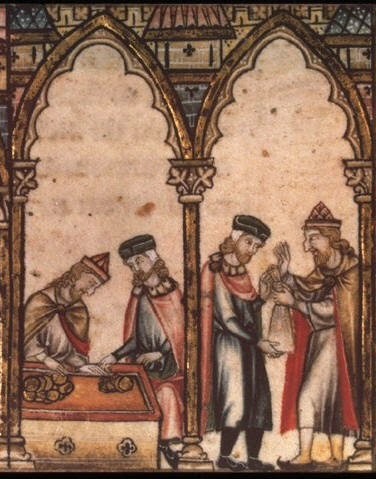 It is far too easy to find images of deceitful, money-grubbing Jews - from the Middle Ages until the present day. Here are two random examples - one from thirteenth century France and another from eighteenth century England. But wait... Who is Beniamin the Jew?! No one really, it would seem... In the Hebrew Bible, Benjamin - the youngest brother of Joseph in Egypt - is a rather endearing figure. But for Michelangelo Buonarroti, Benjamin was only a random Jewish name. In any case, Beniamin the Jew didn't hang around for long. By the next scene, he was already Melchisedec the Jew. Melchisedec = מַלְכִּי־צֶדֶֿק (pronounced Malki Tzedek) is spelled various ways in Italian and English. Roughly translated, it means King of the Righteous. In the fourteenth chapter of the Book of Genesis, Malki Tzedek - King of Salem and Priest of El Elyon - blesses the Patriarch Abraham and offers him bread and wine. Prefiguring the coming of Christ and the Sacrament of the Eucharist. (Day One, Novella Three in the Decamerone), "Melchisedech Giudeo"
is identified as Jewish by the circular segno on his shoulder. For Michelangelo Buonarroti the Younger - immersed in the tradition of Tuscan story-telling - another Melchisedec probably came even more immediately to mind. This Melchisedec was the unlikely Jewish hero of Boccaccio's Tale of the Three Rings (Novella delle tre anella) - one of the best-known comic narratives in the Decamerone. 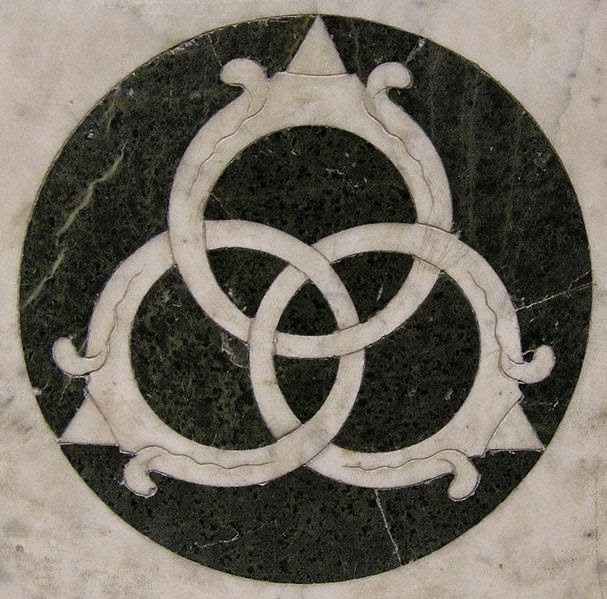 Three rings, emblem of Lorenzo "the Magnificent" de' Medici. Marbòle inlay at the Holy Sepulcher (Florence, San Panacrazio). 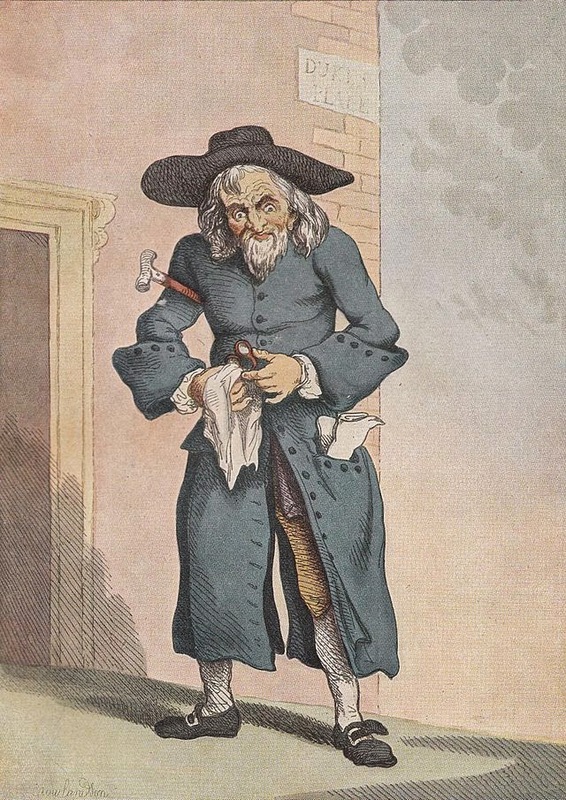 Melchisedech was a voracious Jewish money-lender in Alexandria, Egypt. Saladino, the Muslim Sultan of Babylon, summoned him to resolve a grave financial problem. Fearing the Jew's rapacious nature, he sought to confound him with a daunting (and potentially compromising) philosophical and moral question. 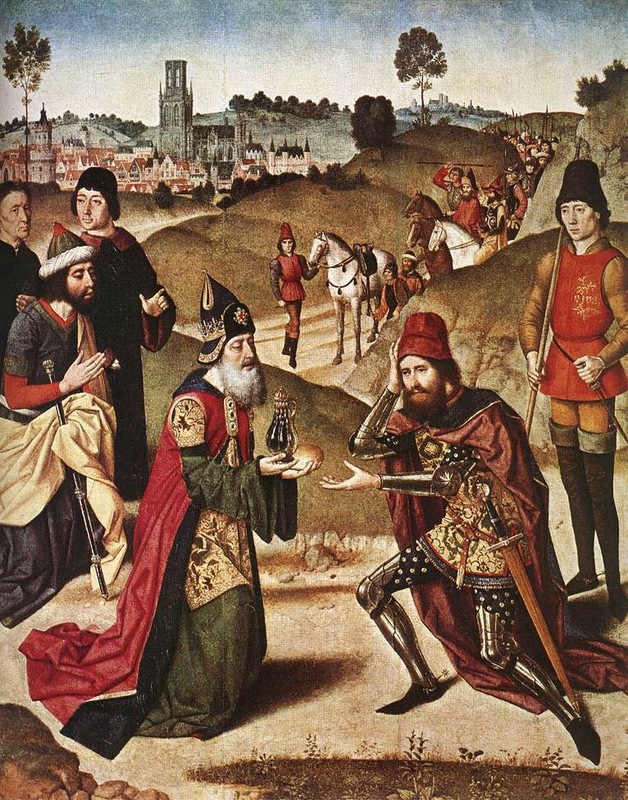 Which of three great religions - Judaism, Christianity and Islam - was the true one? "O my lord, your question is good! I’ d like to tell you the tale of a rich old rich man who had three children and one beautiful and precious ring. He loved all of his children equally and it was the family tradition to leave the ring to only one heir. So, he was hard-put to select a single rightful owner." "Then he asked a goldsmith to make two copies of the ring - so accurate that only he would discern the original. When he died, each of his sons received a ring and thought he was the sole heir. " "But then a vociferous argument broke out regarding the terms of the inheritance - and to this day nobody knows who the rightful owner might be. And so, My Lord, I tell you that God gave three religions to three peoples. And everyone believes that his is best". 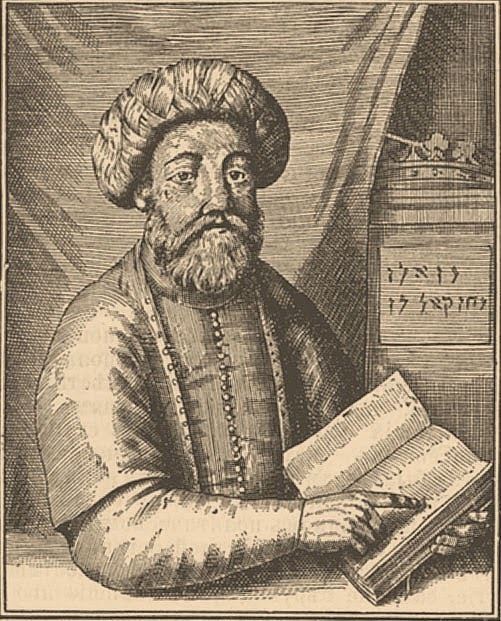 Saladino was profoundly impressed by the Jew's explanation and they became close friends. Melchisedech also resolved the Sultan's financial difficulties and established himself as a trusted advisor. But what do we really make of Boccaccio's Melchisedech Giudeo? An ambiguous hero at best, he engages Jewish stereotypes yet rises above them. In any case, Boccaccio's Melchisedech and Buonarroti's Melchisedec share an essential trait. Both Jews are in on the joke. They play along with a nod and a wink, reshaping the game to their own rules. Many thanks, Ar! I too am intrigued by this story, which (among other things) demonstrates the strange complexity of history. I still have another post or two to add to this series. The next will discuss Michelangelo Buonarroti the Younger's personal experiences with Jews (as documented in the Florentine archive).